Cover letter example for a Paramedic position. 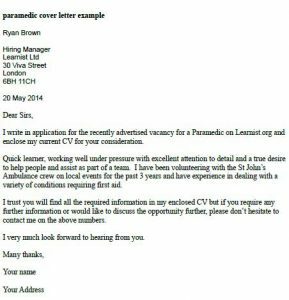 You can amend this letter as suitable and apply for latest Paramedic job vacancies. I write in application for the recently advertised vacancy for a Paramedic on Learnist.org and enclose my current CV for your consideration. Quick learner, working well under pressure with excellent attention to detail and a true desire to help people and assist as part of a team. I have been volunteering with the St John’s Ambulance crew on local events for the past 3 years and have experience in dealing with a variety of conditions requiring first aid. I trust you will find all the required information in my enclosed CV but if you require any further information or would like to discuss the opportunity further, please don’t hesitate to contact me on the above numbers.